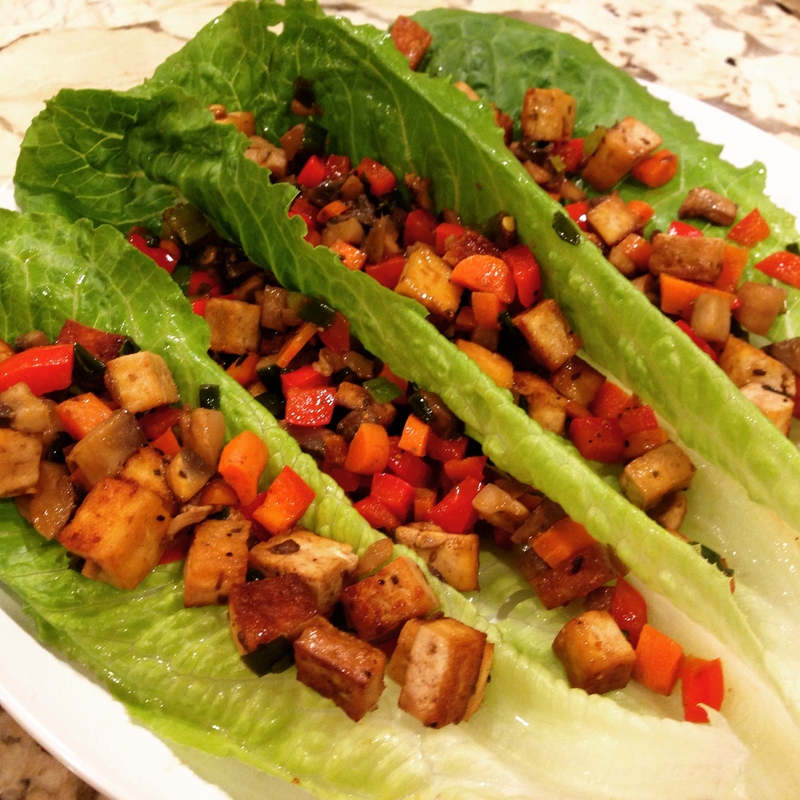 Our go-to, use-it-all-up, everyone-loves-it dinner is lettuce wraps. Something about biting into a cold, crisp lettuce leaf filled with a warm mixture is just plain pleasing and delicious. I know soy is controversial. Some believe that because it is plant based, it can be consumed in mass quantities. NOTHING should be eaten in mass quantities. There have been claims about soy’s benefits from reducing your cholesterol and risk of heart disease to its detriments on raising estrogen and the risk of breast cancer. My view: moderation. 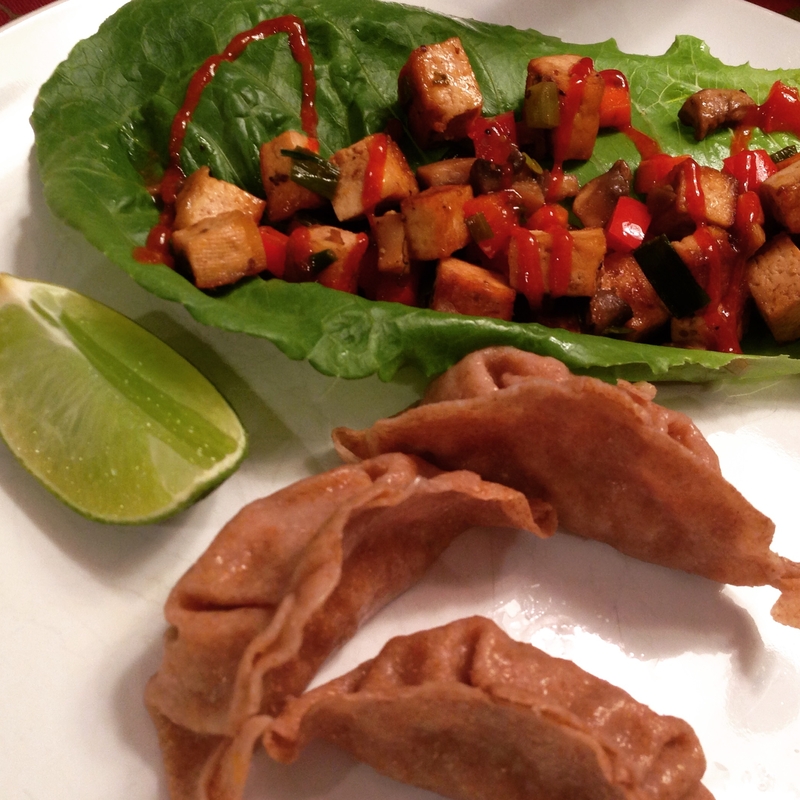 We eat organic, normally sprouted tofu 1 or 2 times a month at home and use a low sodium, non-GMO, gluten free soy sauce 3-4 times a month or for a soy-free option, coconut aminos. Soy is the second most planted crop in the U.S. (corn is first) and highly pesticided so you want organic. Fortunately, I’ve only seen organic tofu anyway at most grocery stores. You can also make this recipe with another type of protein or even all veggies. 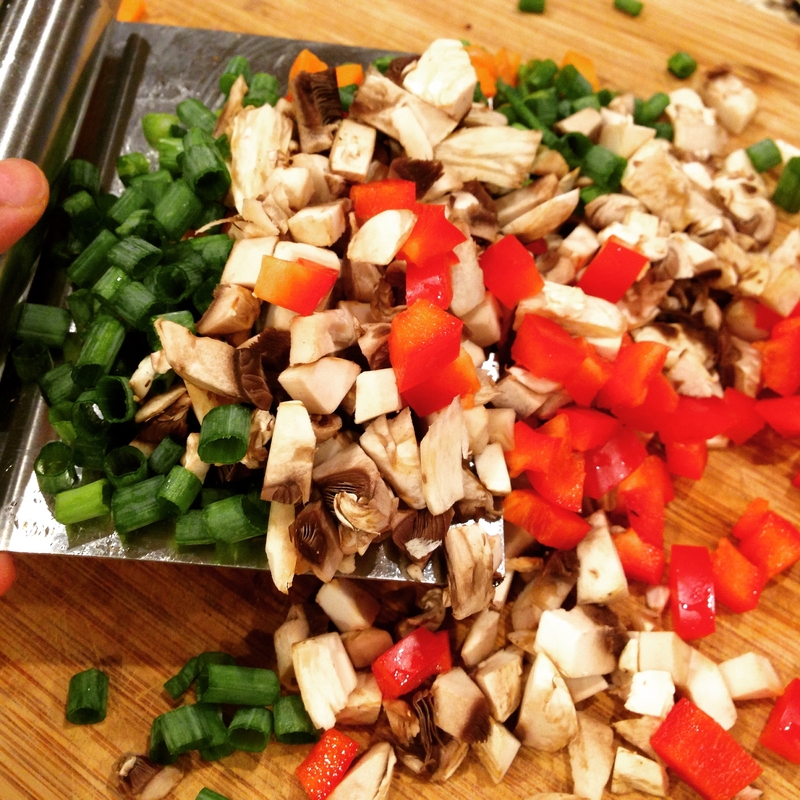 While the tofu does its thing, I prepare the crunchy carrots, tasty scallions, meaty earthy mushrooms, and juicy bell pepper. Prepping as much as you can, and using the the time while another ingredient is cooking, is key in making a 30 minutes or shorter meal. Well browned tofu plus the addition of a sweetener like agave nectar or mirin gives the it a toasty texture and appetizing glaze. Do you have a scraper? It is one of my handy kitchen tools. I have two. Trust me, you need it! I use it to pick up a bunch of chopped up food at once from my cutting board as well as to scrape my cutting board clean under water. 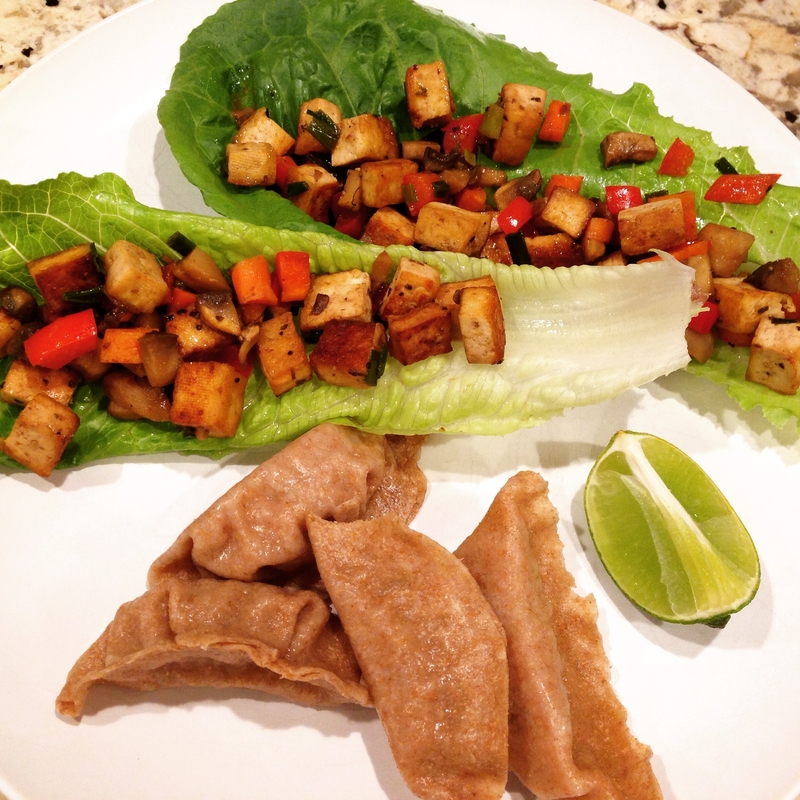 A squeeze of fresh lime brightens the dish and you can use any type of lettuce for these mouth-watering wraps. Serves 4 for a light meal or serving with something else, otherwise double if main attraction! 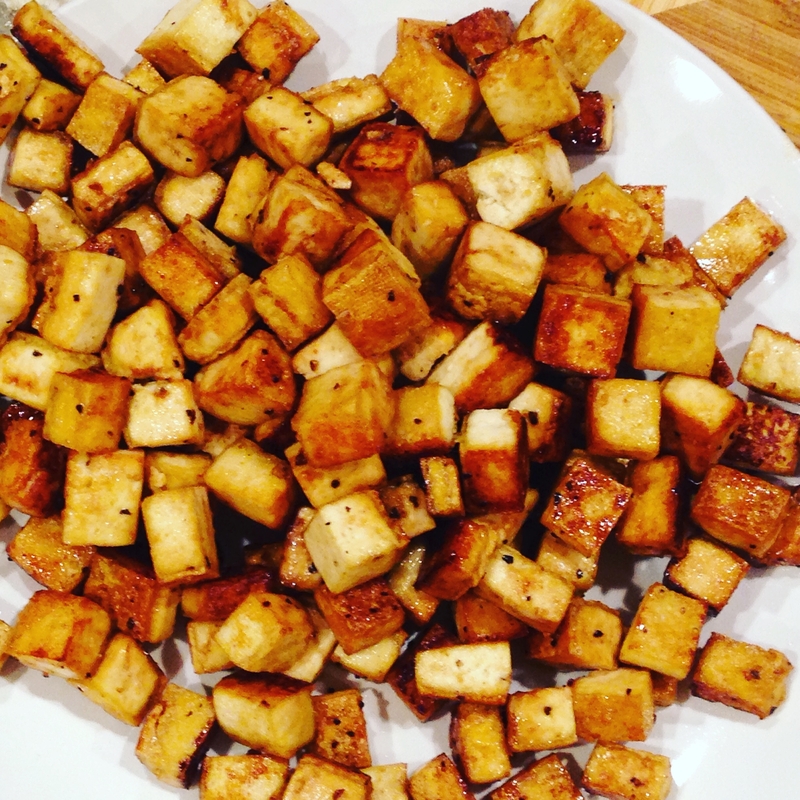 Dice up tofu into approximately 1/2 inch cubes. Heat coconut oil in a large pan over medium heat. Add tofu, turn up heat to medium-high and flip occasionally. 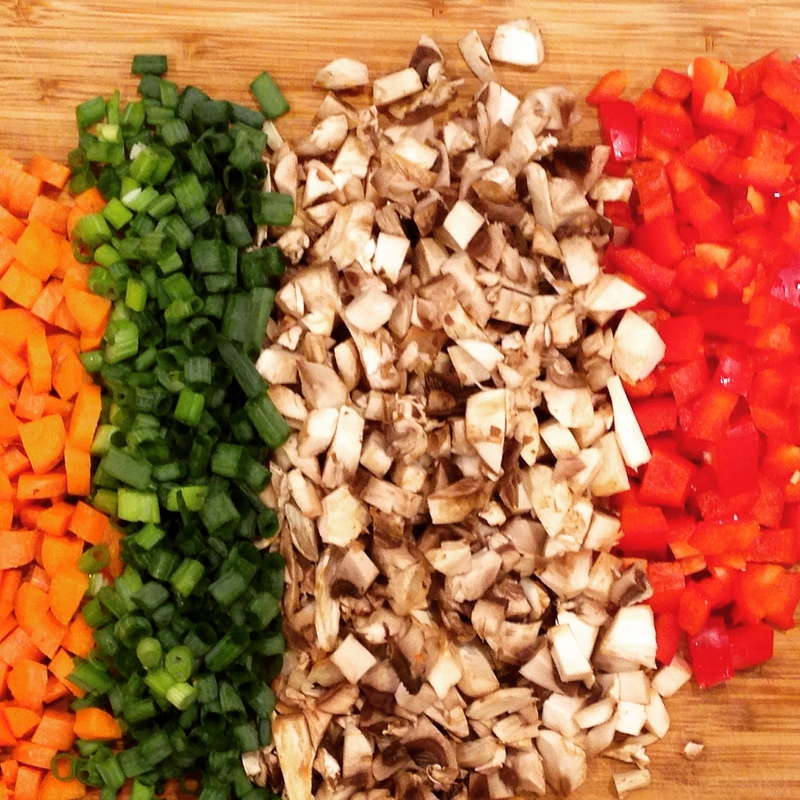 Ideally, you want to brown most sides of most pieces. 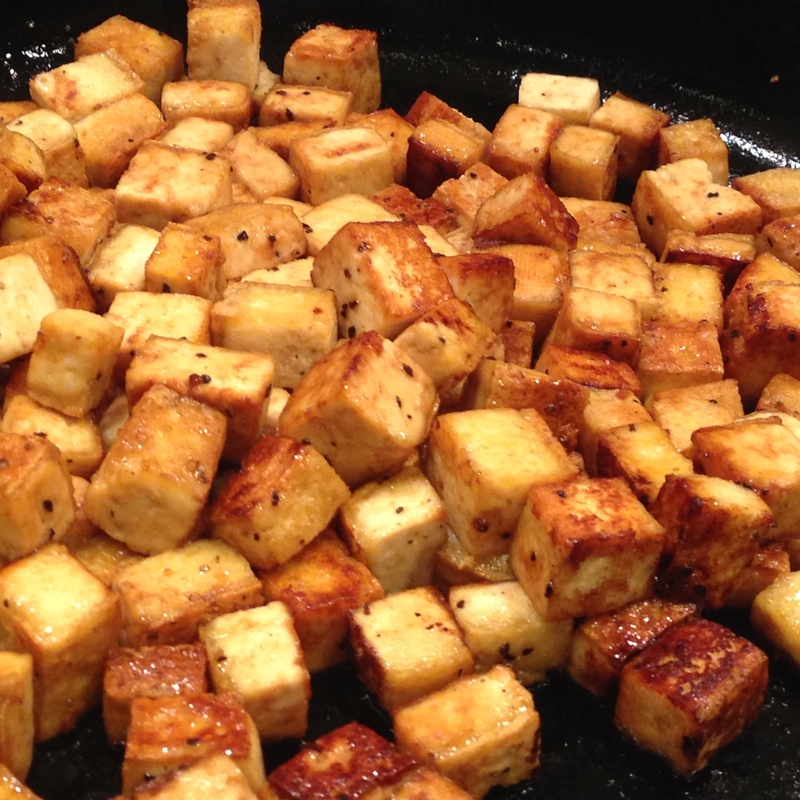 The tofu should be pretty well browned in 10-15 minutes. Then add 1 tbsp soy sauce, 1 tbsp rice vinegar, and 1 tbsp mirin or agave. Stir to coat and cook a few more minutes. Remove from pan into a bowl. You can now use the same pan for your vegetables. Turn heat down to medium and add the sesame oil as well as all of the vegetables and ground ginger. Stir fry for about 5 minutes then add the remainder 1 tbsp soy sauce and 1 tbsp rice vinegar. Add the tofu back in and combine. Fill up those lettuce leaves and enjoy. I have to top mine with Sriracha of course 🙂 .